WASHINGTON – Congress needs to double the number of immigration judges and reorganize the immigration court system to cope with a record-high 375,000 backlogged cases, two of those judges said Wednesday. Judges Dana Leigh Marks and Denise Noonan Slavin said a fix “wouldn’t be cheap,” but that action must be taken to relieve the logjam of cases – including 15,000 in Arizona’s four immigration courts, according to government data compiled by Syracuse Univeristy’s Transactional Records Access Clearinghouse. The two, speaking as officials of the National Association of Immigration Judges, said staffing is just one of the problems facing immigration courts, “an alternate legal universe” where those charged with being here illegally can face years waiting for justice. “Immigration judges are doing so many things, we look like the guy behind the curtain in the ‘Wizard of Oz,’” Marks said of the nation’s current 227 field immigration judges. Besides having too few judges, courts face a shortage of other personnel, she said, including bailiffs and translators: 83 percent of cases last year required foreign language interpreters handling more than 200 different languages. And many detainees could be killed if they are returned to their country of origin, Marks said. “Immigration judges deal with cases that are often, in fact, death penalty cases,” she said. Due to the number of cases and lack of resources, immigration detainees typically wait 15 months for an arraignment hearing and three to four years before a judge hears the merits of their case, Marks said. Because there is no statute of limitations on deportation cases, some cases can be decades old. Marks and Slavin also called on Congress to move immigration courts out of the Justice Department, where they are currently housed, to add at least 200 more judges and to bolster resources for the entire system. Restructuring the system would save in the long run, Marks said, by cutting down on class-action lawsuits filed by detainees frustrated with delays in their cases and by reducing the number of appeals which are more expensive for the government. Marks, who is based in San Francisco and has been an immigration judge for 27 years, declined to put a price tag on the cost, saying the judges’ association is still investigating the costs of restructuring the system. She is not optimistic Congress will act, however, pointing to its inaction in the past year on comprehensive immigration reform. While no lawmakers have yet committed to the association’s plan, Marks did applaud a provision included in the Senate’s comprehensive immigration reform bill that would add 225 immigration judges to the system by 2016. That bill passed the Senate last summer, but has since stalled in the House. Sen. Jeff Flake – who with fellow Arizona Republican Sen. John McCain was part of the “Gang of Eight” that sponsored the immigration reform bill – could not be reached Wednesday to comment on the judges’ proposal. But a spokesman noted in an email that Flake, a member of the Senate Judiciary Committee, co-sponsored legislation in July authorizing the hiring of 100 temporary immigration judges, among other reforms, in response to a surge in unaccompanied child immigrants earlier this year. Immigration Judges Dana Leigh Marks, left, and Denise Noonan Slavin called on Congress to halp fix record-high caseload backlogs in the immigration court system. 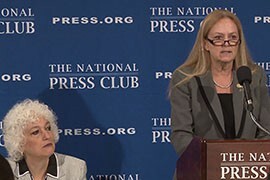 They spoke as president and executive vice president, respectively, of the National Association of Immigration Judges.